FOR SALE WE HAVE A 2003 03 ACURA RSX-S OEM FACTORY THROTTLE BODY ASSEMBLY DC5 K20A2 PRB 4134. ITEM IS IN GOOD CONDITION AND FULL WORKING ORDER.THIS ITEM IS USED AND MAY SHOW SIGNS OF IMPERFECTIONS SUCH AS SURFACE SCRATCHES AND SCUFFS. FOR SALE WE HAVE A 2003 03 ACURA RSX-S OEM FACTORY THROTTLE BODY ASSEMBLY DC5 K20A2 PRB #4144. ITEM IS IN GOOD CONDITION AND FULL WORKING ORDER.THIS ITEM IS USED AND MAY SHOW SIGNS OF IMPERFECTIONS SUCH AS SURFACE SCRATCHES AND SCUFFS. 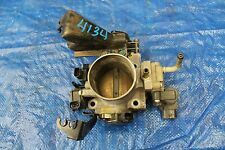 FOR SALE WE HAVE A 2003 03 ACURA RSX-S OEM FACTORY THROTTLE BODY ASSEMBLY DC5 PRB K20A2 #4136. ITEM IS IN GOOD CONDITION AND FULL WORKING ORDER.THIS ITEM IS USED AND MAY SHOW SIGNS OF IMPERFECTIONS SUCH AS SURFACE SCRATCHES AND SCUFFS. Acura RSX 2004-2004 base, AT, from VIN 4S017904. Acura RSX 2004-2004 premium (Canada mkt), AT, from VIN 4S801753. Vehicle Model: RSX. Part # or Vehicle Model: RSX. Vehicle Make: Acura. Vehicle Year: 2004. 2002-2006 Acura RSX (Type-S) 2.0L K20A2, K20Z1. Skunk2 throttle bodies undergo an extensive design and testing process to produce a throttle body that doesn't just provide more flow but retains smooth drivability and OEM throttle characteristics. Model: ACURA RSX. ACURA RSX 04 Base, AT, from VIN 4S017904. ACURA RSX 04 premium (Canada market), AT, from VIN 4S801753. Throttle Body/valve Assy. All rebuildable vehicles and body parts are sold on an "as is" basis. 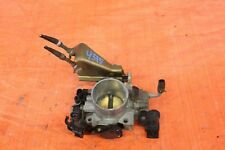 FOR SALE WE HAVE A 2002-2004 ACURA RSX-S K20A2 OEM FACTORY ENGINE THROTTLE BODY DC5 ASSY #4315. THIS ITEM IS USED AND MAY SHOW SIGNS OF IMPERFECTIONS SUCH AS SURFACE SCRATCHES AND SCUFFS. ANY ISSUE WITH OUR USED PRODUCT FOR WARRANTY PURPOSES MUST BE STATED ON A VAILD RECIPT FROM ASE CERTIFIED REPAIR FACILITY. ANY ISSUE WITH OUR USED PRODUCT FOR WARRANTY PURPOSES MUST BE STATED ON A VAILD RECIPT FROM ASE CERTIFIED REPAIR FACILITY. -IF A ITEM HAS BEEN ALTERED OF ITS PHYSICAL AND FUNCTIONAL FORM IN ANY WAY, IT VOIDS TAE AUTHENTICITY. IF A ITEM HAS BEEN ALTERED OF ITS PHYSICAL AND FUNCTIONAL FORM IN ANY WAY, IT VOIDS TAE AUTHENTICITY. Compatible with : DC5 TYPE-R, RSX TYPE-S / EP3 TYPE-R, SI ( doesn't fit on the RSX base model !). 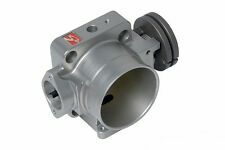 Throttle body size : 70mm. 2006 Acura RSX Type-S Coupe 2-Door 2.0L 1998CC 122Cu. l4 GAS DOHC Naturally Aspirated. IT IS OUT OF A 2004 ACURA RSX BASE 2 DOOR HATCHBACK WITH A 2.0L ENGINE DOHC I-VTEC AND AUTOMATIC TRANSMISSION. RSX 02-03 Base, WITH AUTO TRANSMISSION. RSX 02-03 premium (Canada market), WITH AUTO TRANSMISSION. Engine: K20a2 K20z1. Skunk2 throttle bodies undergo an extensive design and testing process to produce a throttle body that doesn't just provide more flow but retains smooth drivability and OEM throttle characteristics. Acura RSX 2002-2003 premium (Canada mkt), AT. Acura RSX 2002-2003 base, AT. Acura RSX 2004-2004 base, AT, thru VIN 4S017903. Acura RSX 2004-2004 premium (Canada mkt), AT, thru VIN 4S801752. Vehicle Model: RSX. Skunk2 Pro-Series Billet Throttle Body: The Skunk2 Racing Pro-Series Billet Throttle Body increases horsepower and torque by optimizing airflow to your engine. On forced induction applications, this quick bolt-on has shown gains of 50 HP. Skunk2 is proud to introduce its 70mm Pro Series Throttle Body for the RSX Type-S and Pro Series Intake Manifold (part number 307-05-0310) in its signature, hard anodized finish. Skunk2’s Pro Series Throttle Bodies are designed to be used with OEM Acura RSX (PRB) or Skunk2 Pro Series Intake Manifolds for bolt-on horsepower and torque gains by optimizing engine airflow (other applications, including ’06 Civic Si RBC manifolds, require adapter plate). LKQ SKU: LKQ318 ~161272663 THB61001. This is NOT a manufacturer part number, and can be disregarded. We do our best to prevent these issues from happening and apologize for any inconvenience it may cause. LKQ SKU: LKQ710 ~170149384 THB61001. This is NOT a manufacturer part number, and can be disregarded. We do our best to prevent these issues from happening and apologize for any inconvenience it may cause. LKQ SKU: LKQ560 ~146715864 THB61001. This is NOT a manufacturer part number, and can be disregarded. We do our best to prevent these issues from happening and apologize for any inconvenience it may cause. LKQ SKU: LKQ720 ~179119055 THB61001. This is NOT a manufacturer part number, and can be disregarded. We do our best to prevent these issues from happening and apologize for any inconvenience it may cause. K20A/A2 and K20Z1 Throttle body, also K20A3 Throttle body only from the Honda Civic EP3 hatchback. We designed the 6061 billet aluminum housing, while they provide the internal sensor that closely matches the specifications we need. Model: ACURA RSX. Interchange: ACURA RSX 05-06 Canada market, premium, AT. ACURA RSX 05-06 US market, Base, AT. Throttle Body/valve Assy. Fits: 2002-2004 Acura RSX K20A3 base. this is the throttle body from a 2002 Acura RSX K20A3 automatic transmission. our inventory number 2291. Parts are used so wear and tear is expected. For sale is a throttle cable assembly removed from a 2002 Acura RSX Type S. The item pictured in the ad is what you will receive. RSX 05-06 Canada market, premium, AT. THROTTLE BODY. Windshield Wiper Parts. Window Switches. Trim Pieces. Suspension, Steering & Brake. Steering Wheels. Starters & Alternators. Fits: 2002-2004 Acura RSX K20A3 base. this is the throttle body from a 2003 Acura RSX K20A3 automatic transmission. Parts are used so wear and tear is expected. FOR SALE WE HAVE A 2003 ACURA RSX TYPE S OEM FACTORY THROTTLE BODY ASSEMBLY K20A2 PRB #4293. THIS ITEM IS USED AND MAY SHOW SIGNS OF IMPERFECTIONS SUCH AS SURFACE SCRATCHES AND SCUFFS. -IF A ITEM HAS BEEN ALTERED OF ITS PHYSICAL AND FUNCTIONAL FORM IN ANY WAY, IT VOIDS TAE AUTHENTICITY. "Standard Throttle Position Sensor --. Condition : New. Therefore all implied warranties that may apply to your part are limited to the duration of this written warranty. Each warranty gives you specific rights, and you may have other rights which vary from state to state. used throttle body valve assembly100 YEARS IN BUSINESS! M odel: RSX TYPE S. Make: Acura. Part: throttle cables. Year: 2006. Warranty is only on parts. You will receive the exact part that is pictured, no extra parts included. The parts sold are good used condition and tested. LKQ SKU: LKQ754 ~208024346 THB61002. This is NOT a manufacturer part number, and can be disregarded. We do our best to prevent these issues from happening and apologize for any inconvenience it may cause. Get Shipping Discount now! Check Shipping & Payments. (Does not fit RSX Base). All automotive products sold are for use in the United States (USDM) market only. Grams Performance 550cc fuel injectors are chosen by professional motorsports and performance enthusiasts because of their quality, consistency, value, and ease of use. Flowed and balanced to within 1% for consistency. Fits: 2002-2004 Acura RSX Type S K20A2. this is the throttle body from a 2002 Acura RSX Type S K20A2 manual transmission. Parts are used so wear and tear is expected. LKQ SKU: LKQ740 ~209538684 THB61002. This is NOT a manufacturer part number, and can be disregarded. We do our best to prevent these issues from happening and apologize for any inconvenience it may cause. "Dorman Fuel Tank Vent Valve --. DORMAN FUEL TANK VENT VALVE. Condition : New. Therefore all implied warranties that may apply to your part are limited to the duration of this written warranty. Each warranty gives you specific rights, and you may have other rights which vary from state to state.